We are proud to announce being AS9120B certified by ISA recently and would like to take this opportunity to express our sincere thanks for your continued commitment and loyalty! The AS9120B confirms we not only value superior quality, service, innovation, flexibility and reliability by words!With our goals focused on the emphasis of quality assurance and innovative production, we look forward to bringing the business to new heights. 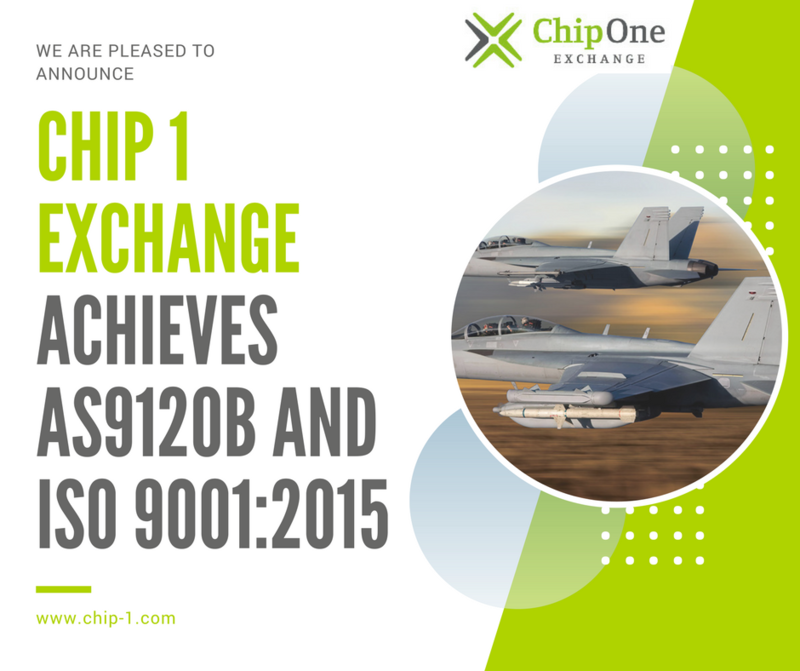 As part of its evolution toward becoming a top tier global distributor, Chip 1 Exchange is pleased to announce its certification under both the AS 9120B and ISO9001:2015 standards. These rigorous standards give customers the assurance that the registrant has demonstrated the ability to consistently deliver products and services which meet both customer expectations and regulatory requirements. Additionally, AS 9120B certification insures supply chain integrity for those companies providing products to the aviation, aerospace and defense industries. Established in 2001 in Frankfurt, Germany and launching its U.S. operations in 2007, Chip 1 Exchange is a franchised distributor of electronic components for medical, automotive, industrial, defense, mobile computing, consumer and aerospace applications. In addition to component sales, Chip One offers design services, BOM analysis, inventory and life-cycle management. 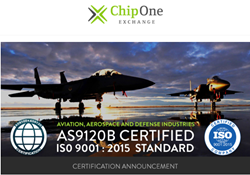 This certification confirms we not only value superior quality, service, innovation, flexibility and reliability by words!Chip 1 Exchange′s decision to become AS9120B certified is a proactive one that not only anticipates the demands of our customers, but also demonstrates a commitment to providing quality products and services to all our customers. We will always strive to exceed your expectations.